* I like to use a wild rice/brown rice blend. Pour 1/2 cup wild and 1/2 cup brown rice into 2 1/4 cups of boiling water plus 1 tsp of extra virgin olive oil and 1/4 tsp salt. Cover reduce heat to low and simmer for 45 to 5o minutes until water is absorbed. 2. Wash pumpkins. With a sharp knife slice the very tops of the pumpkins off. Next, scoop out the seeds and save for roasting or do whatever you want do with the seeds. I find that a serrated grapefruit spoon works the best. Set aside. 3. Peel and chop the onions and garlic. In an large sided sautee pan over medium-low heat, heat the olive oil. Add the onions and garlic and saute until the onions are soft and transparent, about 5 minutes. Remove from the pan and set aside. 4. In the same pan turn the heat up to medium-high, add a splash of olive oil if needed, and add the ground turkey. Season the turkey with 1/4 tsp of Kosher salt and 1/4 tsp of pepper. Brown the meat until cooked through, about 8 to 10 minutes. 5. 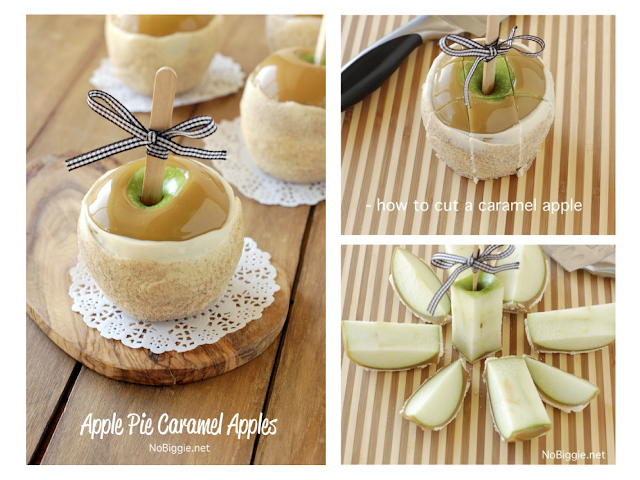 While the turkey is browning, slice, core (peeling is optional), and chop the apple into small cubes. 6. When the turkey is cooked, turn the heat to medium-low. To the turkey add the onions, apples, dried cranberries, walnuts, rice, sage, oregano, and chicken broth. Add the remaining salt and pepper. Stir to combine scraping any bits of browned bits off the bottom of the pan. Taste and add any extra salt and pepper if needed. Simmer until the broth is absorbed, about 3 minutes. Remove from heat. 8.Remove from the oven, plate, and serve. FOR WONDERFULLY DETAILED COOKING INSTRUCTIONS CLICK THE ABOVE PICTURE. Rub 1 teaspoon olive oil on the cut side of the pumpkin. Place cut side down and place in oven. 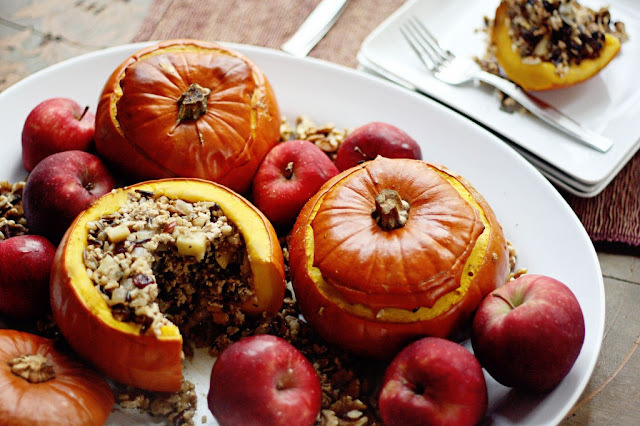 Bake the squash for at least 30 minutes, or until a knife inserted into the skin slides in easily. Remove and cool; then peel the pumpkin, removing the flesh. Meanwhile, heat 1 tablespoon of olive oil over medium heat in a large stockpot. Add the onion, carrot and celery and sweat for at least 8 minutes. Add the salt, pepper, squash, potatoes and apple. Stir well. Add the broth and enough water to just cover and stir well, scraping up any brown bits from the bottom of the pot. Simmer for 25 minutes, or until the potato is very tender. Add the greens and simmer for another 8 minutes. Using an immersion blender, blender or food processor, blend the soup until a smooth consistency. Season with additional salt and pepper to taste. If you desire, add about 1/3 cup of milk, half and half, or cream and thin with water. Alternately, you can add cubes of skinned squash to the soup with the potatoes, so no roasting is necessary. 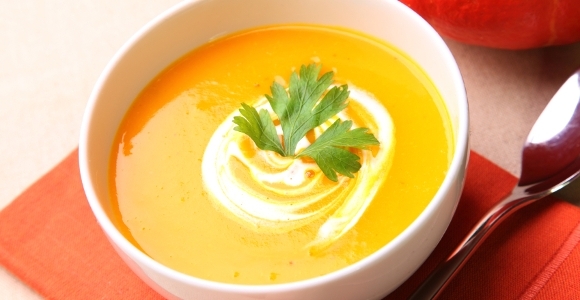 Enjoy the hot soup topped with a dollop of fat-free Greek yogurt. 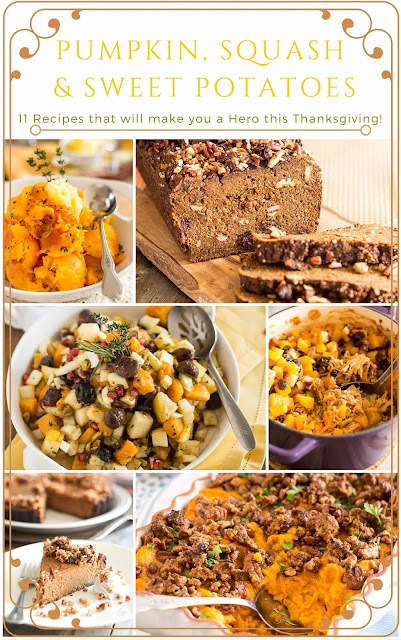 CLICK THE PICTURE BELOW FOR 11 FALL RECIPES! FROM THE JEROME FARMERS MARKET TO YOUR DINNER TABLE!